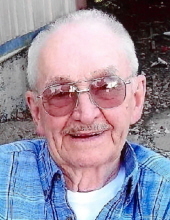 Harold E. “Shorty” Herdrich, 91, of Franklin, Iowa, passed away at 8:00 a.m. Saturday, January 19, 2019, at his home. Born November 1, 1927, in Franklin, Iowa, the son of Emil and Bessie (Buttroff) Herdrich. On June 19, 1948, he married Wanda M. Ramsey in Fort Madison, Iowa. She preceded him in death on June 29, 2016. Survivors include his children: Pamela Taylor of Fort Madison, Linda (Larry) Bolanos of Sioux City, Iowa, Harold “Tony” (Lana) Herdrich of Dallas City, Illinois, Carol Herdrich of Donnellson, Monica (Dale) Stecker of Knoxville, Tennessee, James (Dee) Herdrich of Fort Madison, Cindy (Bob) Howard of Denmark, David (Kris) Herdrich of Omaha, Nebraska and Todd (Nicole) Herdrich of Donnellson; special son-in-law: Tom and Lola Marsh of Farmington; twenty grandchildren; nineteen great grandchildren and several nieces and nephews. He was preceded in death by his parents: Emil and Bessie; wife: Wanda; daughter: Debbie Marsh; two grandchildren; siblings: Arlene Haeffner, Kenneth Herdrich and Maynard Herdrich. Harold served in the United States Army during the Korean War. He retired from John Deere in Donnellson. He was a member of St. Peter’s United Church of Christ in Franklin and the Farmington Rod and Gun Club. Harold loved fishing, decorating cookies, playing Euchre, drinking Kesslers and especially spending time with family. The family will receive friends from 9:00 a.m. to 11:00 a.m. Saturday, February 9, 2019, at Schmitz Funeral Home in Donnellson. A Memorial Service will be held at 11:00 a.m. Saturday, February 9, 2019, at Schmitz Funeral Home in Donnellson with Pastor Michael Bennett officiating. Burial will be at the St. Peter’s Cemetery rural Franklin, Iowa. Memorials have been established in his memory for Farmington Rod and Reel Gun Club or St. Peter’s United Church of Christ. Online condolences may be sent to the family at www.schmitzfuneralhomes.com . The Schmitz Funeral Home in Donnellson is assisting the family with the arrangements. To plant a tree in memory of Harold E. "Shorty" Herdrich, please visit our Tribute Store. "Email Address" would like to share the life celebration of Harold E. "Shorty" Herdrich. Click on the "link" to go to share a favorite memory or leave a condolence message for the family.